I'm a full time bike commuter. Yesterday was a true test. Basically it was wet enough that if I was gonna choose to not ride this was my best opportunity to do so with a legitimate excuse. I did ride and ended up pretty wet. One thing that I didn't have any issues with was cold. Last year around this time, I bought my first couple pieces of Smartwool gear. Smartwool is Merino wool which is not the bulky, itchy stuff that I grew up with. I remember wearing thick natural undyed wool socks when I'd go mountain biking or hiking in nasty weather, but I also wore polypro liners to shield me from the itch. I also had a pretty good collection of awful sweaters that I'd pick up on sale at the Eddie Bauer outlets from time-to-time. You absolutely had to wear a shirt under these things though or people would think you had some sort of rash. When I decided to really commit to getting rid of my car I did some homework on what kind of clothes would be best for the commute. A lot of people mentioned Merino wool. 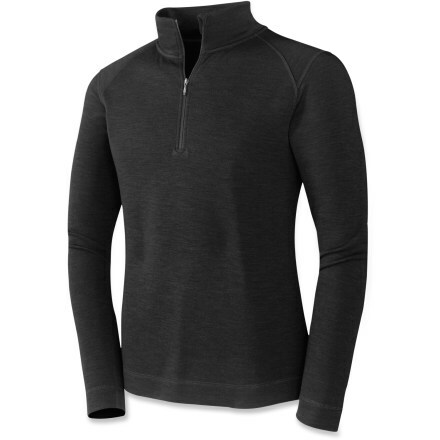 I did some research (fancy word for gear nerdery) and shortly therafter, picked up the Mid-Weight Zip T from Smartwool. I chose the Forest Green as I already have a lot of black in my gear and would certainly spill something on it that would be visible with the light gray color. You probably remember from those old school wool socks that wool retains heat even when it is wet which is why it is so useful, but Merino is even better because it is lighter in weight, stretchy, resilient and doesn't stink. Yup, you heard me right. No funky mountain man odor. Maybe this will gross you out, but I can wear this stuff for commuting all week long with no stink. I have a few pairs of their socks and the same thing is true. I also picked up one of their beanies to wear under my helmet when the temperature drops and it rocks too. Hang them up to dry and they are ready to go the next morning. Of course when you do wash it, just throw it in the washer and dryer with your normal clothes and you are good to go. No shrinkage to worry about. Merino is also good when the temperature creeps back up as it breathes better than cotton, doesn't feel all clammy against your skin and dries quickly as well. I'm able to wear all of my Smartwool stuff through lots of changes in weather, temperature and conditions because of this versatility. In terms of fit and finish, there are a couple things that I love. First of all, the arms are nice and long which works well for cycling. second, the zipper is smooth and has a great little Zipper garage at the top of the collar which keeps from having the back of the mechanism irritate your face or catch whiskers. One thing to note is that these are sized to fit pretty snug. I usually wear a large in most mens shirts and jackets and but with this one, I bought an XXL. I'm not a fan of the clingy fit and wear this as a mid or outer layer fairly often. I'm thinking of picking up one of their light weight or microweight t's before the summer hits and may go with an XL on that. My advice would be to try it on first. REI almost always has them in stock well into late spring from what I've found and the price is comparable to what you'll find anywhere else. They are also awesome with warranty service should you ever need it. I think that I used my dividend and member coupon to buy mine last year. As I mentioned earlier, I have a few other pieces of Smartwool gear including mid height hiking socks, a training beanie, and cycling arm warmers. Bottom line is that this stuff is durable, good looking and very functional for keeping your body temperature right where you want it. I recommend it!